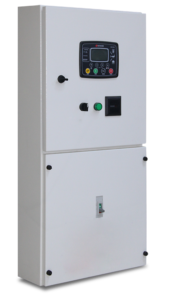 AMF means AUTOMATIC MAINS FAILURE (or A.M.F.). 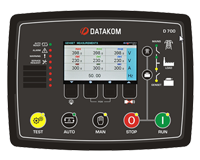 It is about a controller fitted on a panel for the Automatic Control of Standby Generator: AMF Control Panel or simply AMF Panel. . 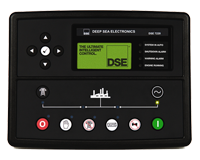 The AMF panel fitted with an AMF controller such as DKG309, D500, D700 or Deepsea 7320 etc.. manages, in a fully automatic way, the connection assignment of the LOAD to MAINS or GENERATOR. 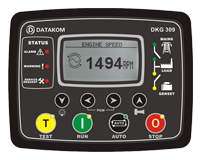 The DKG 309 conrol module is a standard addition to our generator sets and it has been designed to start and stop diesel generating sets that include electronic and non electronic engines. 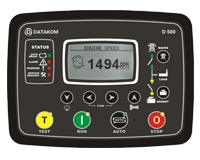 The DKG 309 includes the additional capability of being able to monitor a mains (utility) supply and is therefore suitable for controlling a standby generating set in conjunction with an automatic transfer switch.The DKG 309 also indicates perational status and fault conditions, automatically shutting down the generating set and indicating faults by means of its LCD display on the front panel.